In this mesmerizing voyage to a land “more ice than earth,” Elizabeth Bradfield probes the lives of polar explorers, the people they left behind, and the desires that propelled them. She embarks on this journey “Because this life, this alarm clock time card / percolator direct deposit income tax stop light // seems vast and blank and numbing.” To the vacuousness of modern existence she responds by guiding her readers to “the plenty at the poles”—a frigid wilderness populated not only by caribou, seals, emperor penguins, and polar bears, but also by adventurers, scientists, athletes, and tourists. Bradfield’s burning devotion to her subjects gleams brightly against the glacial landscapes they occupy. The voice of the poet also comes close to autobiography in a series of prose poems entitled “Notes on Ice in Bowditch.” Using definitions from a navigation handbook, she reflects on the intricacies of love. 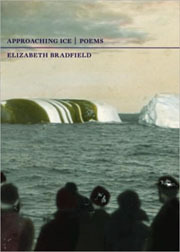 Under the entry for “ice breccia,” Bradfield writes: “Patchwork sewn tight with freeze into one big blanket. The old, old blue with the new white. Different strengths and ways of being brittle. This is my answer to the years between us. There can be fusing. There is a name for it.” With a speaker who frequently submerges herself in the third person, these interludes provide welcome moments of intimacy. Their emotional potency only intensifies as Bradfield reveals more about the partner they address—a woman lover who travels to Antarctica without her, carrying her poems. Bradfield skillfully maneuvers between romantic desire and the passions that impel people to the poles. She portrays early explorers yearning for untouched places, fleeing a world besmirched by human hands. In an ironic turn, she writes of men contriving trials for the sake of recognition, “Their passage loud with anticipated medals, applause.” She even delves into political obsessions with ownership, detailing the Third Reich’s attempt to claim Antarctica by dropping “aluminum darts / tattooed with a crooked cross / every twenty miles into what they saw.” Her insights into the insatiable nature of longing—whether for adventure, accolades, or “the chance to again make human an eden”—lend poignancy to an already exquisite collection. “And what myths would the land write / for itself?” Bradfield muses. With a naturalist’s eye for observation and a poet’s ear for lyricism, she gives an inspired answer in sixty-one penetrating poems that will enthrall lovers of natural history, narrative poetry, and historical fiction.